Yes Hazel wanted one of each type for her own. 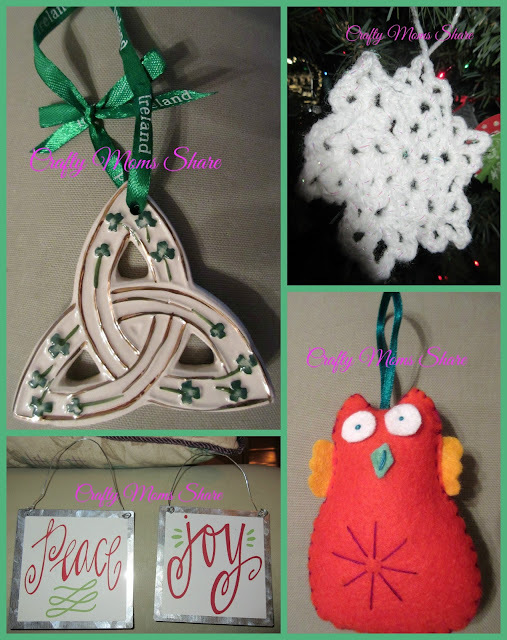 We sent three pairs of ornaments out. We got some fun ornaments from various countries. We got a snowflake and Celtic knot from Ireland, a homemade owl from France (made by a British crafter) and beautiful Peace and Joy ornaments from the USA. Aren't they beautiful. 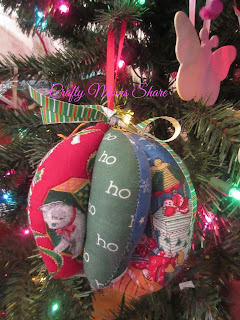 To see more of the ornaments swapped check out Christmas Ornaments Across the World on Multicultural Kid Blogs. The next thing that happened in our season was the Advent Workshop at our new church. Hazel made an Advent wreath. Our new church uses blue candles instead of purple ones. She also made an Advent chain but since there are only two links on it I didn't take a picture for you. 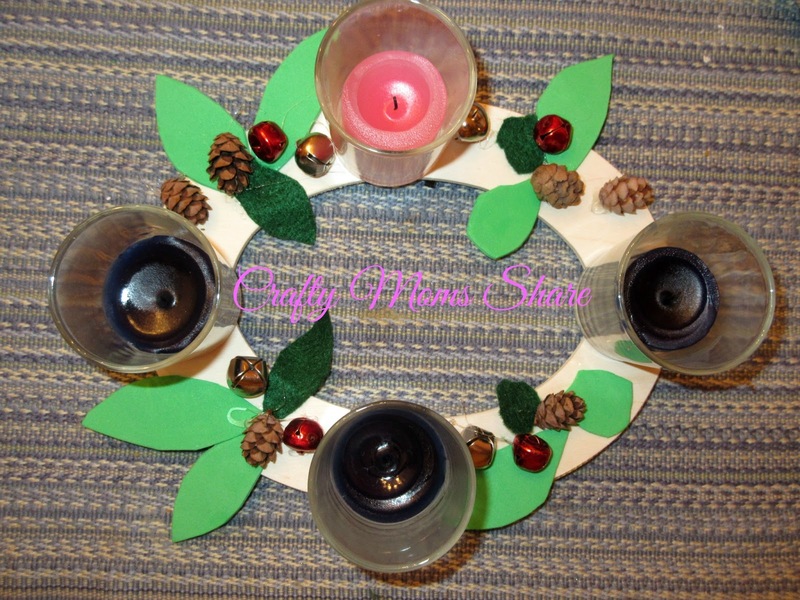 The foundation of the wreath is a wooden oval frame from a craft store. We cut leaves out of felt and foam and then decorated it with pinecones and jingle bells. Isn't it fun? My next struggle was what to put in Hazel's Advent calendar. I found a previously purchased Nativity craft set. This filled some of the days, however for the rest we made a Christmas tree with an ornament a day. I think the whole Advent calendar will be this next year. Stay tuned for some free things to go with it next year! 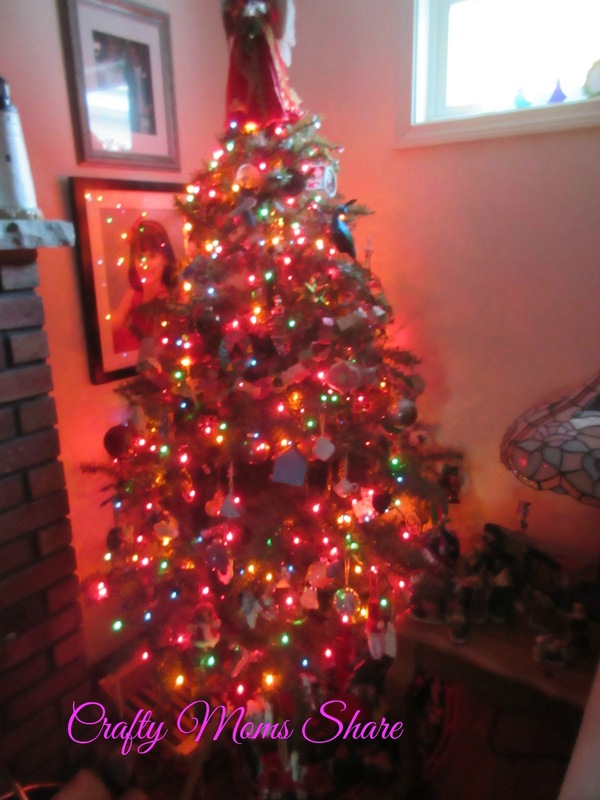 Then we finally got our tree up. We were a week later than usual. 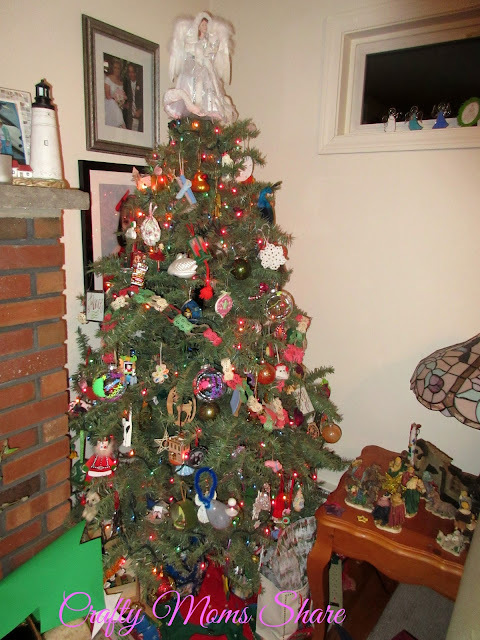 I let Hazel hang most of the ornaments and sure enough the tree fell over. 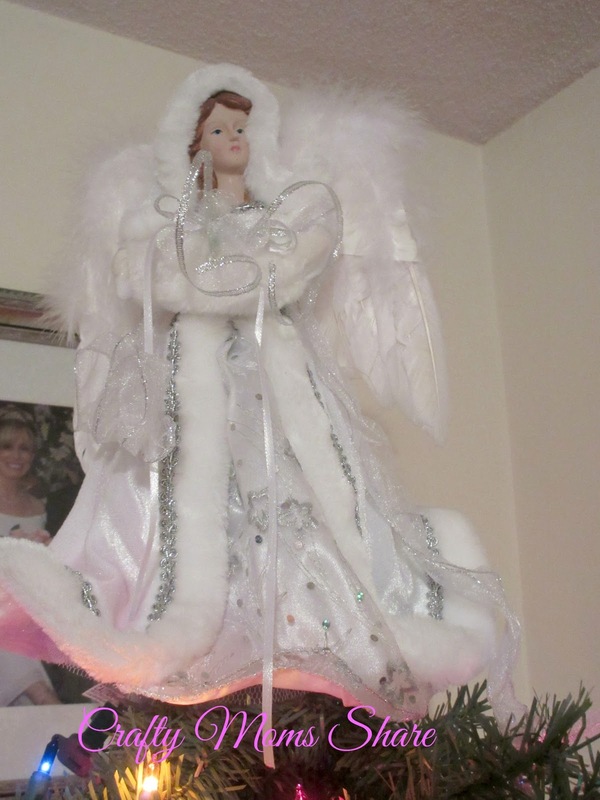 I finally realized it was the large angel on the top, so we went searching for a new smaller angel with brown hair. Have you ever noticed that the angels almost always are blonde? I wonder why. Luckily our local Rite Aid had a brown haired 10-inch angel and the bonus was that she was half price!! Our large brown haired angel now sits in the window between our two lite small trees. Since putting the new one on the tree seems much more stable. Of course it could also be that Steve and I have moved some of the ornaments to distribute the weight. 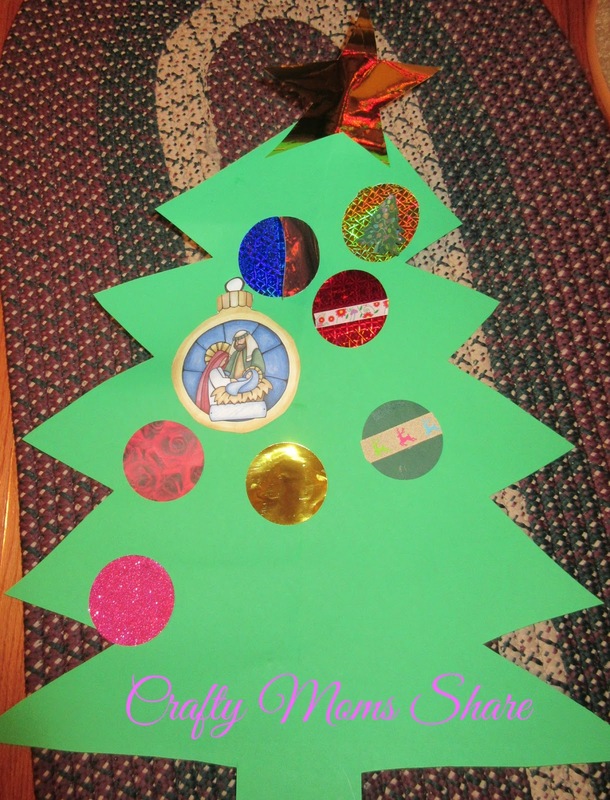 Be sure to check out our post on the history of Christmas trees and Christmas tree traditions as well as a bit about our tree and its ornaments. 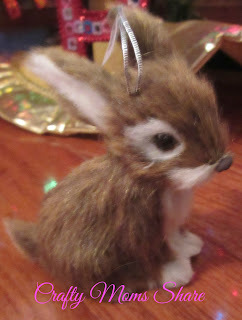 We also decided on Hazel's gifts for family. I bought some of the DIY calendars at work and let Hazel decorate them. I helped with some of them including the one in the pictures. Can you tell which pages I did and which she did? I wrapped them in linen dish towels that happened to be on sale. My sisters have a bit of a dish towel fetish/collection, so I figured it would be perfect. 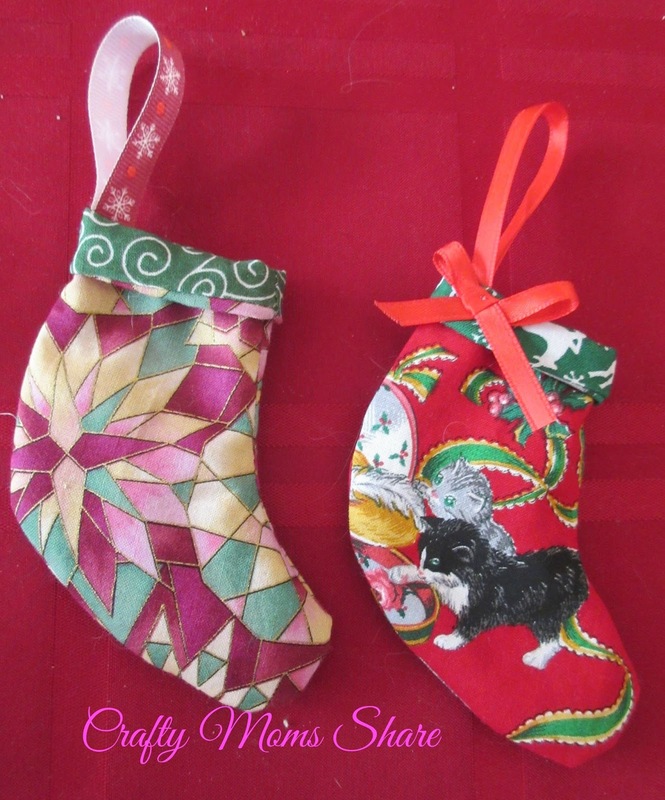 They are so easy to wrap with and no tape was needed!! Plus they are not wasting paper! 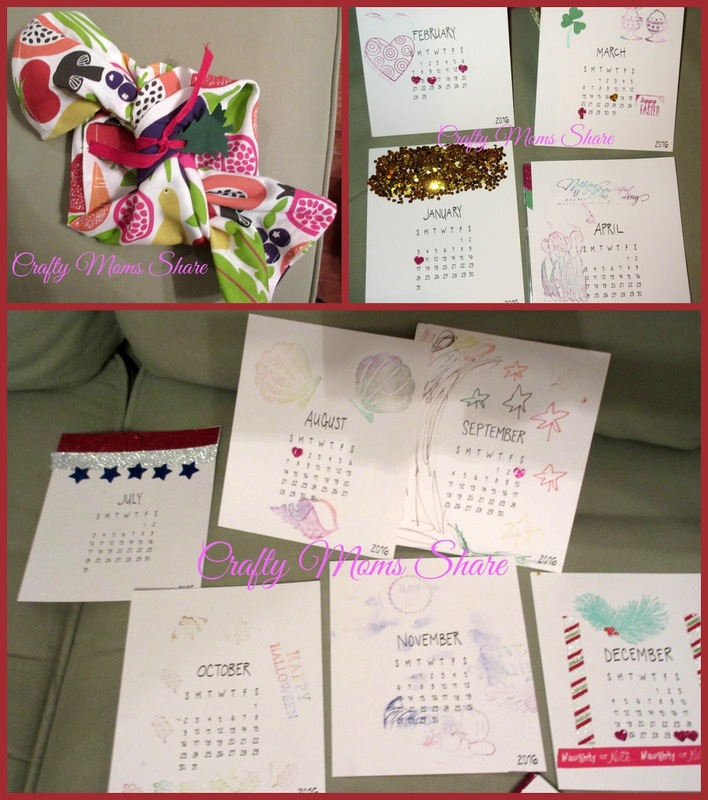 I'm going to suggest everyone saves their calendar cases so next year we can do real DIY ones. 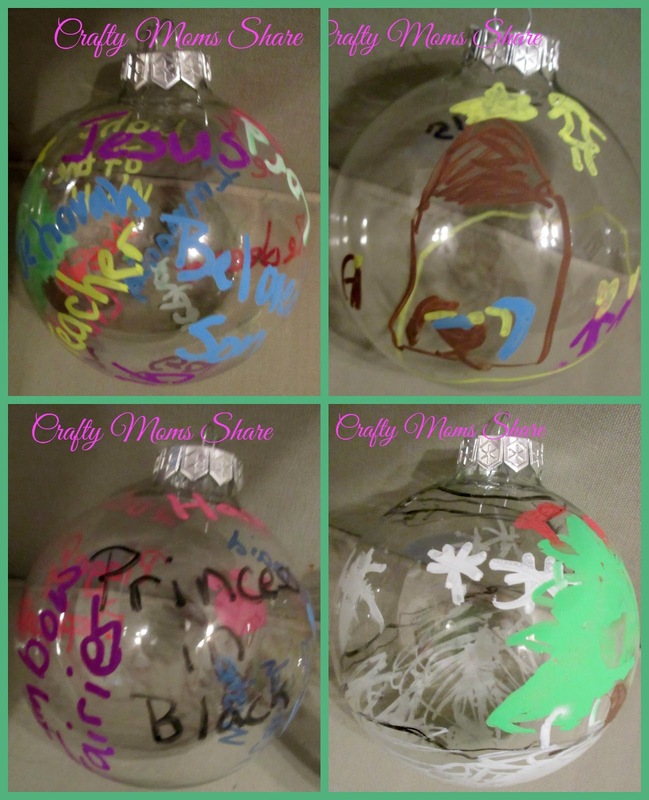 We also decorated large glass ornaments. Our plan was to use the glaze jelly pens, but we found that to be too hard so we pulled out our Chalk Ola markers and had a blast. Hazel decorated two: a winter scene and a Nativity scene. 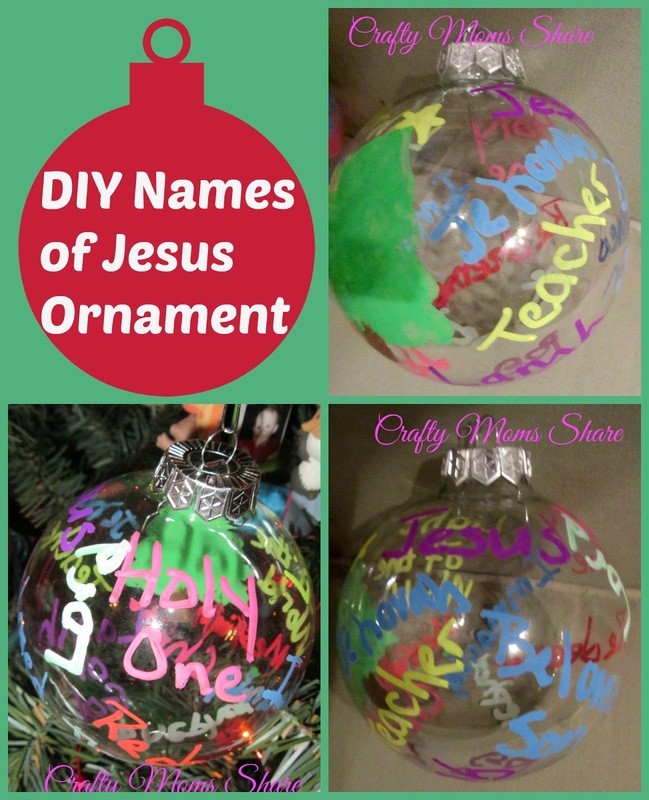 I made a Names of Jesus ornament by writing on various names that refer to Jesus in the Bible. 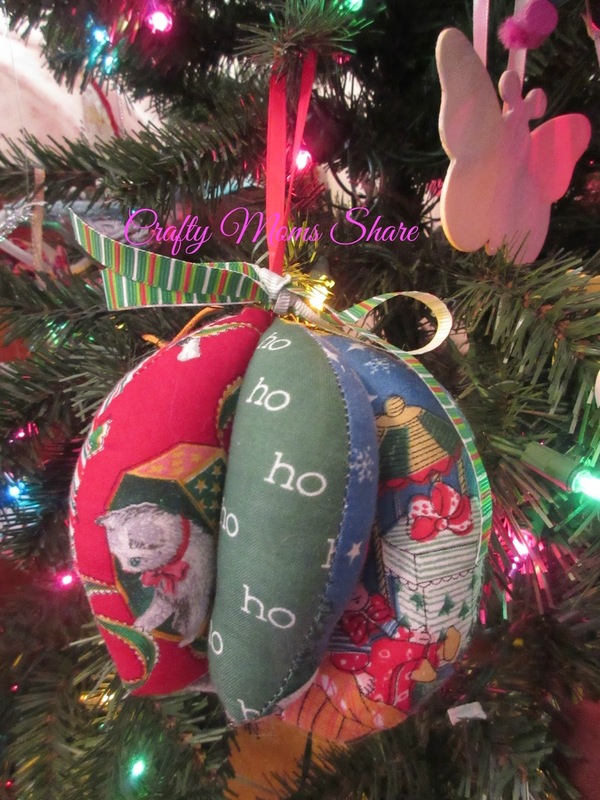 I also made a favorite things ornament for Hazel. 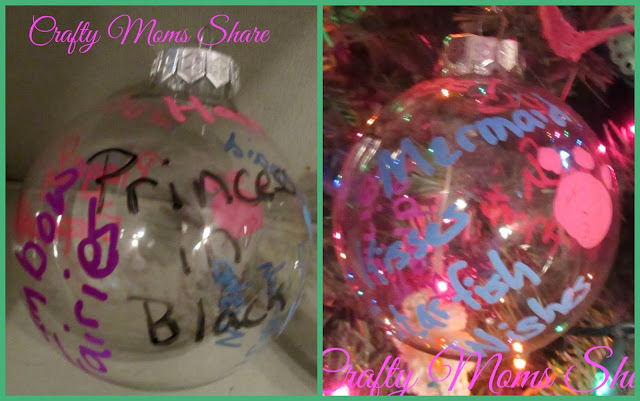 I put her name and the year on the top and then wrote and drew some of her favorite things from this year as well as our favorite saying, "Mermaid kisses and star fish wishes." We finally decorated the gingerbread house from the kit I bought last year. We never had time so it was sitting on our shelf for the year. It also expired, but since we aren't going to eat it I figured it didn't matter. Hazel decided to use the orange lollipop as a mailbox. She doesn't like orange lollipops so she thought this was a perfect use. I put it together for her and let her do all the decorating. 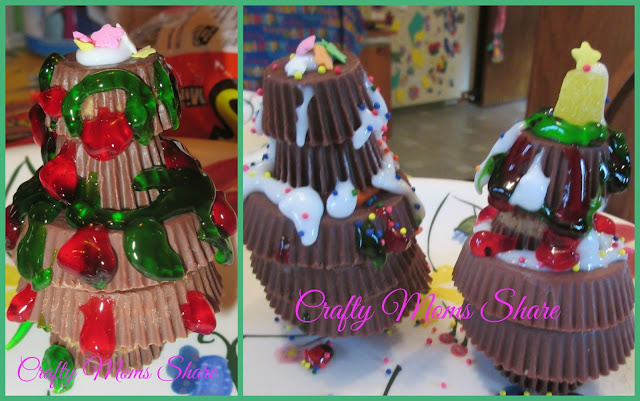 We also made the peanut butter cup Christmas trees (we saw them at One Little Project), but didn't find the correct sized ones obviously. However Hazel had a great time decorating them! 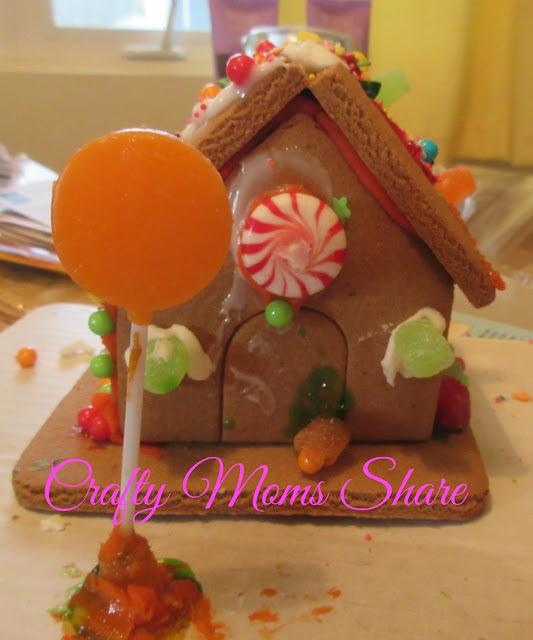 We also had a playdate that was themed around keeping Christ in our focus this Christmas. 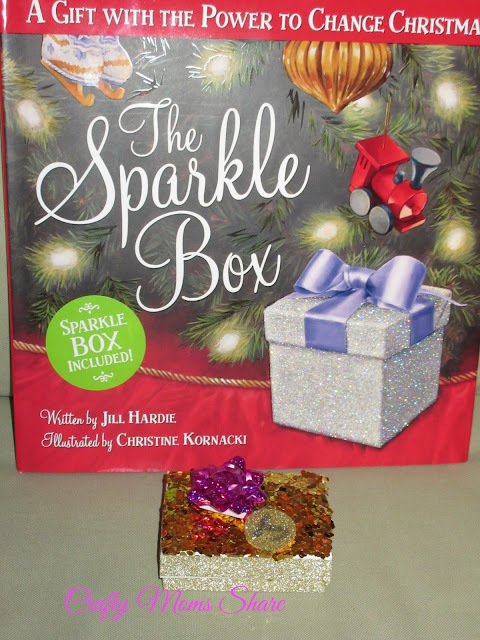 We read The Sparkle Box and the kids made their own sparkle boxes. We used jewelry boxes. 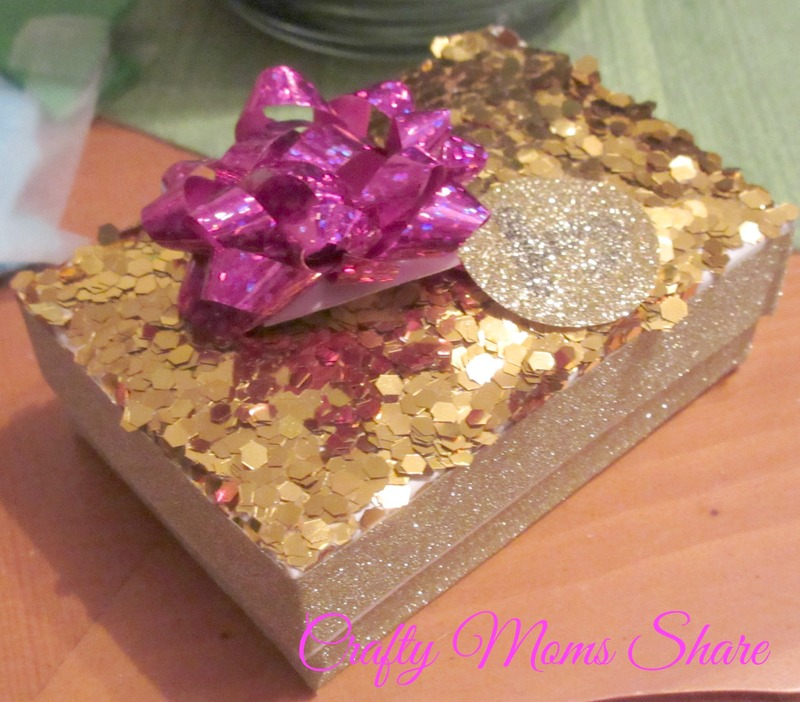 I had the kids wrap gold and/or silver washi tape around the bottom side and the lid's side. The kids used gold on one and silver on the other. Mine used just gold and is pictured. Then we spread glue on the lids and dipped it into a tray of large gold glitter. After it dried we used super tape (the only thing that really sticks to glitter) to attach a bow and little gold sparkle tags with a J on it for Jesus. I was very happy with how they came out and how easy they were to make. They did make a bit of mess with the glitter, but it was worth it. That is what we have been up to but had not shared with you yet. 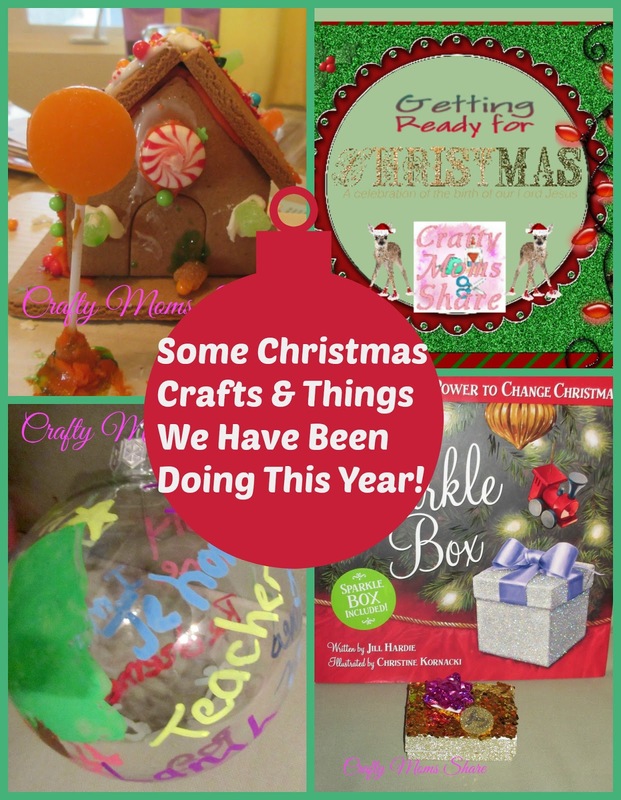 For other crafts be sure to check out our DIY Gift Tags & Cards, Little Christmas Tree Book Review & Craft, and Handmade Christmas and our Christmas Craft Round-up from 2013!